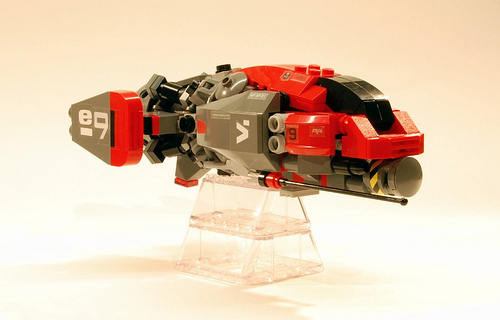 DasNewten tries his hand at a style reminiscent of nnenn‘s microscale ships. And I say he succeeded rather nicely. Just one picture doesn’t do this little beauty justice, so click the photo above to check out more on Flickr. wow. thats amazing! good job! That is one sweet Spaceship. In addition to the fact that this MoC is totally awesome, “Wildsau” is fun to say. ;-) Win. ‘Dasnewten’, Andrew. I don’t think I can edit your posts. Was admiring this at CS. Very, very nice. Ya know, i would have to say this is the best micro I have seen in quite a while.